Please note: The purchase of this software is for a subscription period. Licenses are available for 1 year, 3 years or 5 years. PATGuard 3 is an easy-to-use software program which enables you to record, store and report on a range of health and safety requirements including PAT testing,risk assessments and other workplace test and inspections.Tag records with images as visual evidence, schedule retest periods and produce professional reports and certificates for total traceability. PATGuard 3 PAT software offers total traceability when it comes to maintaining portable appliance testing records, enabling images taken with Apollo 600 or any camera or phone to be tagged against sites, locations, asset IDs and test results - providing evidence of visual inspection. New in Version 3.1.1: Apollo 500 compatibility, Customisable main asset view - including test results, CSV export of Asset view - including test results, CSV data import. Template CSV included, Full row double click to open Assets, Hazards and Site Reports, Upload Test Sequence function moved to Instrument tab, Asset list regardless of tree level selection, Asset In Service check box and report, Asset On Hire checkbox, to text box, and report, In Service / On Hire report, All reports default to "None" for photos. 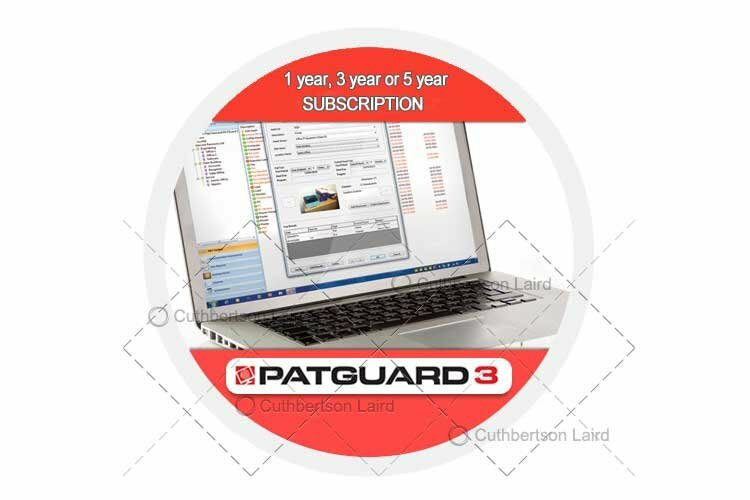 Updates are free to existing PATGuard 3 PAT software users. Operating System: Microsoft Windows XP / Vista / 7 / 8. Compatible with: Internet Explorer 8 or later. Download compatible with a wide variety of PAT testers. Electrical risk assessment tool quickly determines risk-based retest periods. Extensive range of detailed and summary reports. Test and inspection reports for fire detection/alarm systems and emergency lighting. Auto-scheduler function notifies the user when assets are due for retest. Create a professional viewer CD for read only access to test records. Download photos from Apollo 600. Database compatible across PATGuard range. Subscription length: 1 year, 2 year and 5 year.